Home » Anawan News » 1 Year Anniversary, 1 Day Sale! 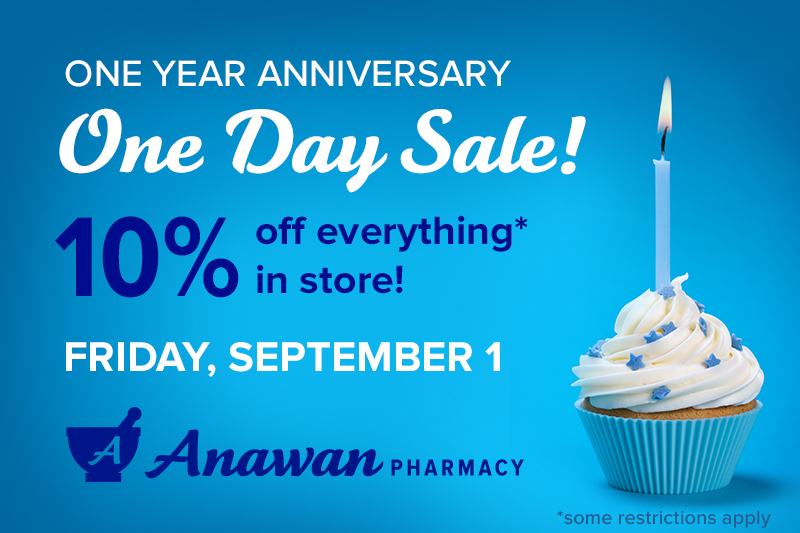 On Friday, September 1, Anawan Pharmacy is celebrating our One Year Anniversary. As a thank you to our customers and community for a great first year in business, we’re having a One Day Sale, where everything* in the store is 10% off on Friday, September 1. While the kids have the day off from school, it’s a great time to get their flu shots done for the 2017–2018 season. As of Friday (9/1/17), the state of Massachusetts allows our pharmacists to vaccinate anyone 9 years of age or older. Stop by anytime between 8am–8pm, and Erik or Rich will be happy to help. Fall is the best time to get vaccinated, since seasonal flu outbreaks can happen as early as October.